Travis is none too happy that Tara is not within the walls of Shamballah, which can only mean that she is in the hands of the enemy, and their forces are much more formidable than his. But it is Tara we are talking about and Morgan will do anything to get her back, even if it seems foolhardy. So a plan is hatched and undertaken with Morgan’s greatest weapon being able to bluff. 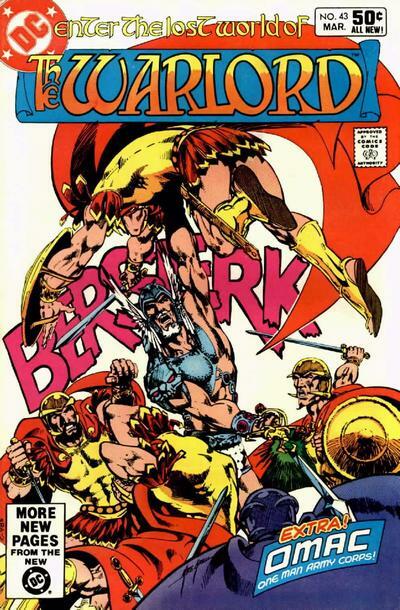 Last issue was good, but Mike Grell gives us one even better with this book. The Warlord is in fine form, taking the action to the enemy in pursuit of the woman he loves, finally looking to get his priorities back on track after gallivanting around the countryside for what seemed like an eternity. What is also interesting of note, but a little ridiculous as well is just how easily Tara forgives the man, simply because he looks good in battle and came to rescue her. It is a little half-baked to think as such, but in a fantastical setting such as this, in a world like this, it is possible to forgive this little bit of poor characterization. Grell’s artwork has also never looked better, being very tight and very detailed and quite exciting to look at. Sadly, there was no Shakira this issue, which was all right, but it is a much better book when her wit is present. Once again, this issue featured a backup tale featuring OMAC which was decent enough but paled in comparison to the main story.